Mission will be celebrating its 30th birthday this year, and has built a reputation for combining style with innovative engineering through three decades. 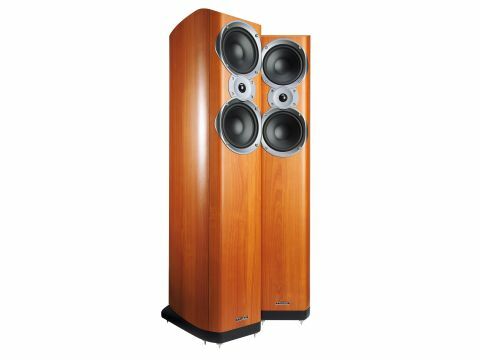 The last few years have seen changes of ownership and the company has joined other famous British hi-fi names (Quad, Wharfedale, Audiolab) under the Chinese-owned International Audio Group (IAG) banner. That said, continuity of design has been fully maintained, and extracting these M66is from their cartons brought a real feeling of déja vu. This might be a new model, but its roots are clearly seen in the V63 and M53 models. There are a number of detail differences, for sure, but the driver configurations and enclosure dimensions are virtually the same, so it's clear that this M66i is essentially a development of its predecessors. The most obvious change concerns the price, which at £495 per pair is £100 less than its predecessors, but one contributing factor here is presumably that a decent quality vinyl woodprint has replaced real wood for surface decoration. That change may well be related to the relatively complex enclosure shape, which is fattest around the middle, and tapers towards the front and the back. It's a two-way d'Appolito design, in which twin bass/mid drivers are placed above and below a solitary tweeter (providing plenty of cone area while keeping the front panel nice and slim). The two magnetically shielded main drivers have 155mm cast frames with 110mm Paramid cones - a paper sandwich either side of a polymer loaded with aramid fibres. The tweeter has a 25mm fabric dome. The box loads the main drivers with a 36-litre air volume and a generous rear port, and twin bi-wire/bi-amp terminals are fitted in a vertical line. The shape confers good basic stability, and is enhanced by an attractive plinth, which accommodates no fewer than six chunky spikes. Regrettably, these are thumbwheel nuts, which have a tendency to work loose. The Mission has a very generous port output, and shows a tendency to 'thump' even when sited in free space, so this is a speaker that's clearly best kept well clear of walls. That said, the upper bass lacks a similar degree of power, drive and sheer 'punch', which might go some way towards explaining why it tends to sound limp and lacking in dynamic expression. Although the basic tonal balance is decent enough, it's not particularly smooth, and while it's creditably free from boxiness, it lacks sophistication and transparency, especially towards the top of the audio band. The treble is quite strong, relatively speaking, and it's not very smooth or sweet either, a combination which is not very inviting, especially if the source or amplification signals are compromised in any way. Speech sounds hollow and echoic, with some chestiness, but it's also coherent, if laid back, with a hint of nasal and pinched colorations. Stereo focus and imaging is respectable enough, although depth perspectives are somewhat constrained. The bottom line, of course, is that this is a big speaker selling at an impressively low price, and if it sounds significantly cheaper than the other five assembled for this group test, that's probably simply because it is significantly cheaper. Naturally, value for money remains pretty good here - just don't expect it to match the performance of models that cost half as much again.